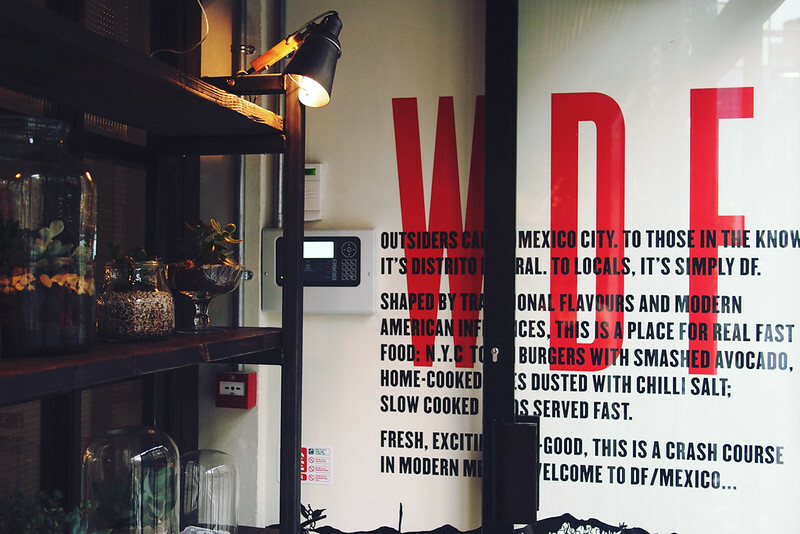 DF Mexico is the latest creation from the stable of London-based Mexican stalwart Wahaca. It takes the same Mexican-street-food-with-an-Anglo-American-twist concept and goes a bit hipster on it to match its location bang in the middle of Shoreditch in the Old Truman Brewery. 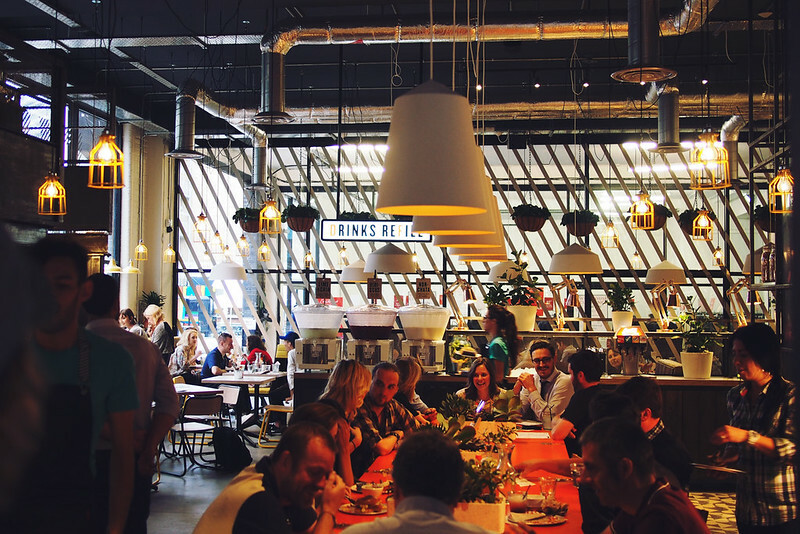 Every aspect is ramped up in the cool factor: the branding and interior decor are boldly industrial, food is counter service, drinks are self-serve and bottomless… even the social media team is sharp and well-pitched. 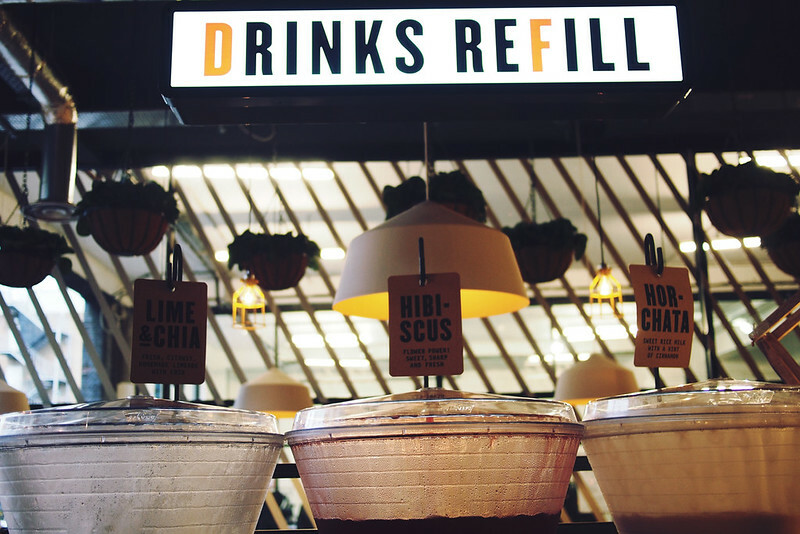 If you were being cheesy you could call it Wahaca’s younger, cooler brother or something. Naturally it wasn’t going to be long before I found myself there, and that day came on Monday evening. It seems to have got off to a flying start, with a short queue at the door even on a Monday and a lively buzz around the dining room. There’s a huge communal table next to the obligatory open-plan kitchen and plenty of smaller tables and booths, so the wait to be seated wasn’t long. 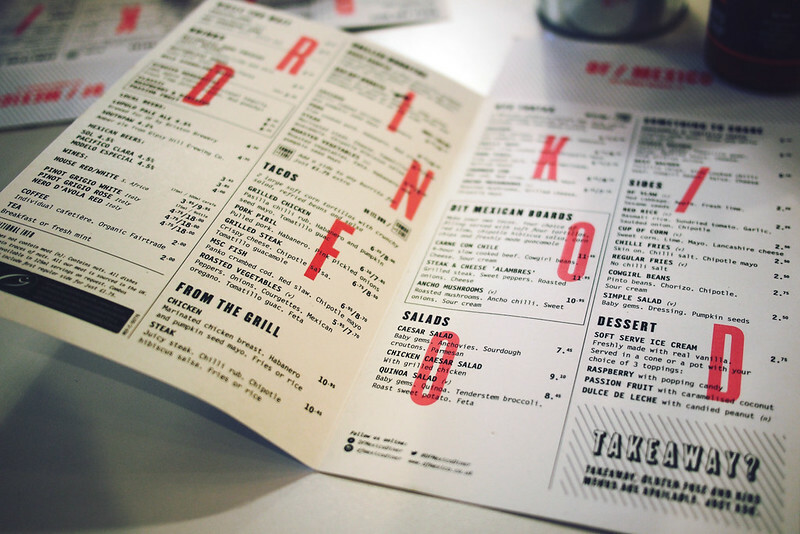 The concept is explained via a cool brochure and the menu reads very well indeed. 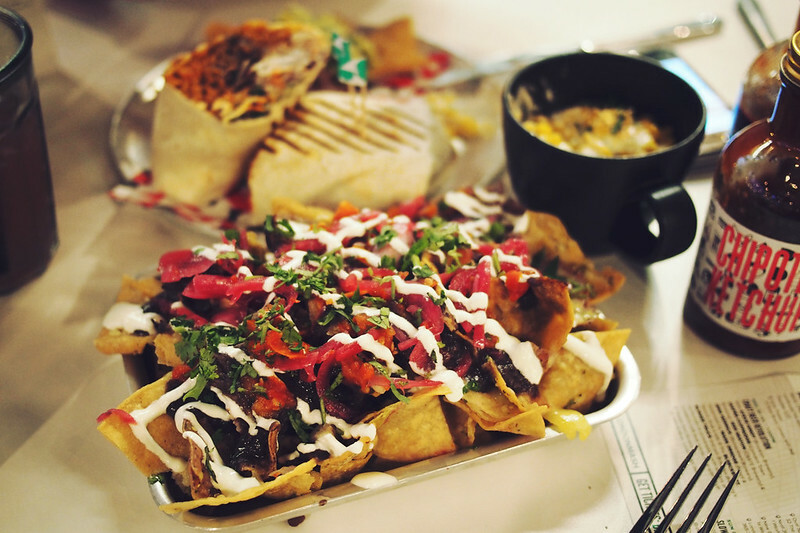 Unlike Wahaca, the food isn’t tapas-sized but built for large appetites and/or sharing. 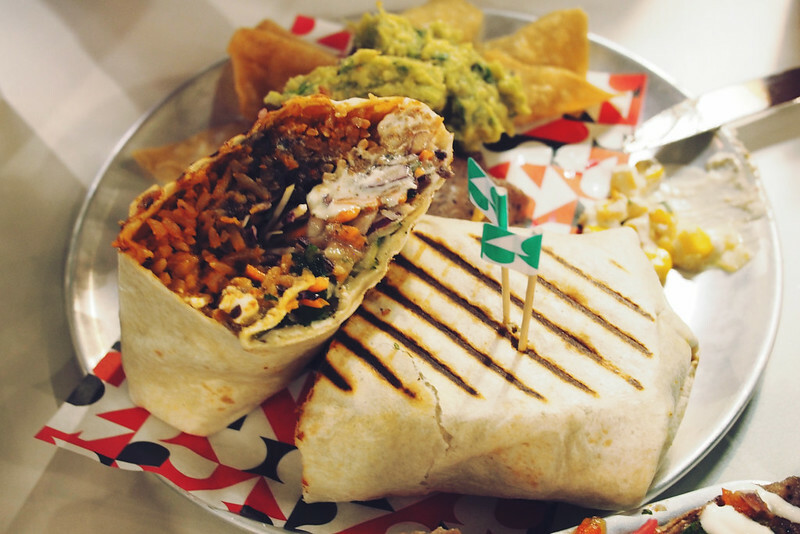 The main offerings are burritos, large tacos, tortas, build-your-own boards, grills and salads, with a (un)healthy sprinkling of sides and sharing dishes too. The hardest part is deciding what to go for. Obviously, we massively over-ordered just to get a little taster of a few things. The Bad Boy burrito comes with white and blue corn chips and an optional side for a couple of quid extra. It packed quite the whack of flavour, with tomato and habanero running through the rice and a core of tasty feta cheese, all wrapped in a chargrilled tortilla. A side of veggie nachos was huge for just £4.95 and was similarly punchy. The topping of refried beans, cheese, pink onions and salsa wiggled into the all the gaps in the chips so you didn’t get that disappointing moment when you run out of topping before chips. Not that we got near to that point; it was too big to finish! Chilli fries were ordered just because, but they were probably my favourite thing: properly salty and hot with a chipotle dip on the side. The cup of corn, sweetly served in a teacup, sat in a creamy puddle of moreish broth and was topped with tangy Lancashire cheese. Self-serve bottomless horchata cooled it all down nicely. There’s also soft-serve ice cream for dessert, but we rolled out defeated before considering it. The bill for this feast? 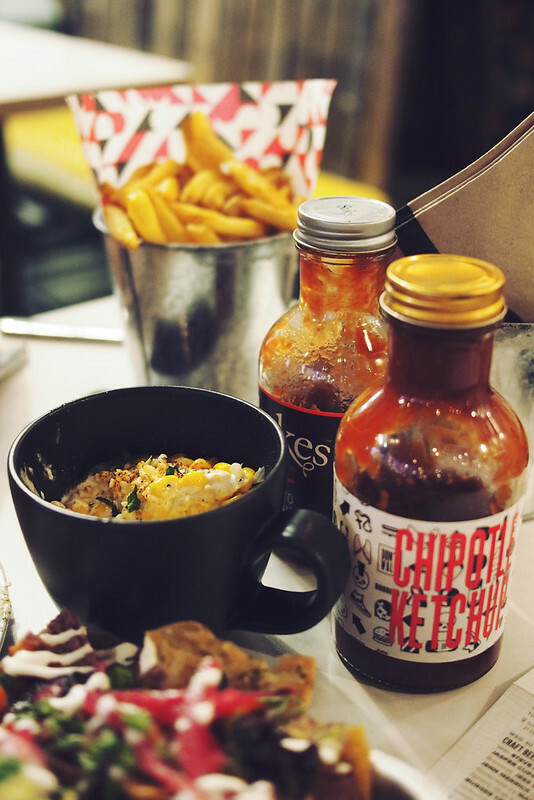 Like Wahaca it’s a real bargain: just £22.50 for a large main, smaller sharing dish, two sides and two bottomless soft drinks. My only critique is I actually wish the portions were a bit smaller more like Wahaca, so you can mix/match and share easier. It’s pretty great to have this place pretty close to home for when I get peckish for big, bad Mexican flavours, and I can’t imagine it’ll be long before I’m back again to try more of the menu and soak up more of the DF vibes (also I’m working nearby and they do take-out…). Nice job, chaps. This looks amazing! The nachos look very generous and I like the design of the menu. I’ll be sure to check it out. This looks incredible! I’m so jealous of all the Mexican options you have around you in London. I went here a couple of weeks ago and was really impressed! The fish tacos, fries and margaritas… delicious. My mouth is watering! We are always looking for new Mexican and this looks fantastic. Thanks for sharing. 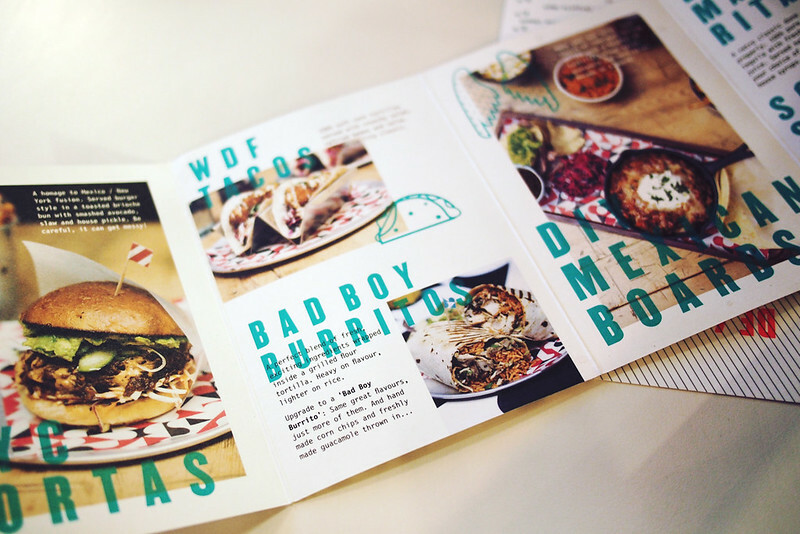 I seriously love wahaca and this looks even better (not that I would’ve thought it possible!) Will definitely have to try it out. Sooner rather than later! My girlfriend and I went on Friday, it was great, I had the Fish torta and the chilli fries which were delicious. She had the tacos also excellent.